Let’s make one thing clear. We’re not perfect. In fact, sometimes we actually screw up. Shocker, right? But, above everything else, there’s one thing we constantly prioritize: transparency. We want to give you all the necessary tools, information, and resources needed to succeed. 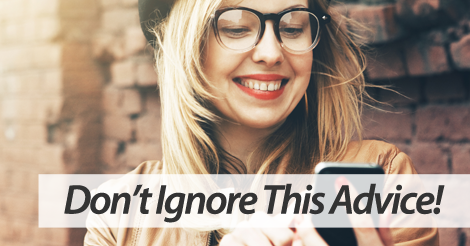 With that said, today we’re giving you the hands down, most important text marketing advice. These three tips are crucial to your new account success. 1. Don’t ignore the guidebooks. Want to skim over the infographics? Go ahead. Not too keen on our video tutorials? Fine. But above all else, do not ignore our guidebooks. The Beginner’s Guide to SMS Marketing is a necessary read. In addition, the SMS Marketer’s Guide to Compliance is absolutely crucial. Ignoring these helpful resources will put you way behind. 2. Anticipate your subscriber’s preferences. Don’t shoot out off the cuff campaigns. Don’t use text marketing as a way to get rid of leftover inventory. Make sure all your campaigns are high value. This will ensure text marketing success. When you know what your subscribers want, you can easily increase the value of each interaction. 3. Be prepared for growth. We stand by our service. If done correctly, text marketing can help you grow your small business exponentially. Instead of doubting this growth, prepare for it. Make sure you have the necessary resources to provide for all campaigns. For example, let’s say you own a restaurant. Don’t run a huge burger promotion if you only have 3 patties left. Be smart about campaign creation. Anticipate greatness. Join forces with top online texting service, SlickText.com. Give us a buzz today at 1.800.688.6290 to learn more, or head over to the pricing page and sign up for a free plan. Our feature rich platform boasts excellence. Our product development team is constantly on a quest for innovation. Partner up with a provider that respects and understands your desire for long term growth.